Remember when everything in an office was gray file cabinets and puke-yellow colored manila envelopes? 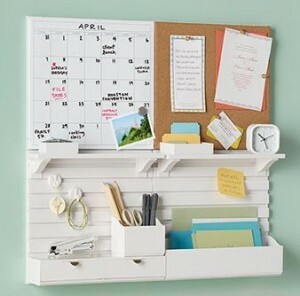 We can look back at those as the Dark Ages of ugly offices and happily decorate and organize today’s office with pretty and functional office products like those from Martha Stewart’s Office Line at Staples! The notebooks are $9.99-$23.99 depending on the size you choose and I didn’t see any accessory that was over $20 so you aren’t going to break the bank with this one. Wall Manager – I love this one for the busy Mom’s kitchen. So many possibilities for the disorganized chaos that is our daily lives! You completely customize this one by piecing it together on the Martha Stewart Home Office Wall Manager page at Staples.com. Totes – Take your office on the go when you have to travel for work! 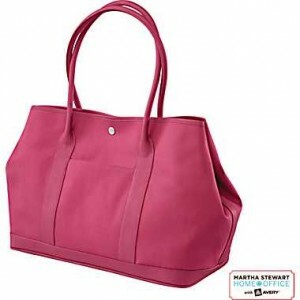 These Martha Stewart Totes by Avery are $79.99 at Staples.com. « LOVE My New Watch Bling from Judith Ripka @QVC – She’s on TODAY! I grabbed these last year when they first came out. 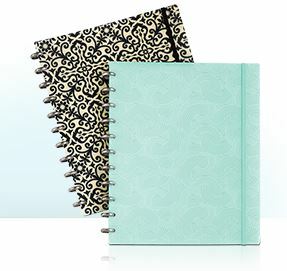 I love the little notebooks that they have to keep jotting down ideas on the go. That bag would be perfect for any conference or work meeting.